* DRYY: The long-empty retail space fronting M Street between the 55 M lobby and the subway station now has funky new signage, announcing that Dryy, "full service garment care," is coming soon. This will bring the number of garment care options in the neighborhood back to two, along with Wells Cleaners at the Yards. * WISEGUY: Intrepid JDLand commenter JES tweeted these photos of the Wiseguy space at Canal Park, showing both the pizza operation and the gelato operation. I had not thought about Wiseguy's pay-at-the-counter setup, which actually might be a better use of the space than previous incarnations. As for when it will open, We Shall See. * PAVING: CSX announced that paving of the 200 and 300 blocks of Virginia Avenue is next on the tunnel-wrapping-up agenda (and I saw that the 200 block got its blacktop yesterday). Also coming this week, weather permitting, is the paving of the "specially designed permeable bicycle lane surface." This side path will run from the 200 block all the way to 11th Street (along the north side of Virginia Avenue Park). Other than that, I got nuthin'. Enjoy the fresh comment thread! Time to catch up on some tidbits you may have missed (and also time to open a new thread for the JDLand commentariat). * THE HARLOW: A public meeting last week to update residents on Capper/Carrollsburg's redevelopment status passed along the news that the building at 2nd and L across from Canal Park will be known as "The Harlow," which does roll off the tongue a bit more easily than the current "Square 769N Apartments." The building is expected to open in spring 2019, and will have 179 apartments, of which 36 will be affordable units. It will also have about 4,000 square feet of ground floor retail. The update also said that DCHA is still planning to move forward with Square 767 next, as a condo building and separate rental building. That plan still needs to start its way into the Zoning Fun Factory. * SHOOTING ON 5TH: There was a shooting in front of the Capper Community Center at 5th and L in the wee hours of July 21. MPD described it this way: "At approximately 0320 hours unknown number of suspect(s) approached the victims that were in front of 1005 5th Street SE in dark colored vehicle. The suspect(s) opened fire on the victims wounding both of them. One victim was shot multiple times and transported to the hospital, the other victim was shot in the leg and transported to the hospital. The suspect(s) and suspect vehicle fled in an unknown direction. It is unsure how many individuals were in front of 1005 5th Street SE. Two weapons were recovered in front of the recreation center, also multiple shell casings found on the scene and there are rifles casings among the shell casings." Capitol Hill Corner summarized the subsequent MPD 1D community meeting. * BRIDGE NEWS: If you're interested in the new Douglass Bridge, check out "Progress," the spiffy quarterly update. And you'll also see the spiffy Douglass Bridge logo. 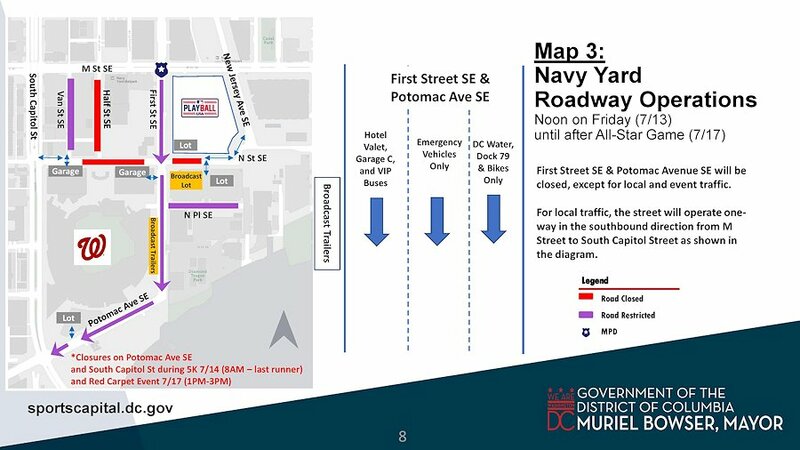 * TUNNEL NEWS: If you're interested in the Virginia Avenue Tunnel (or, at this point, the Virginia Avenue Streetscape Restoration), the latest "Coffee with Chuck" slides give estimated timelines for when the remaining portions of the street should reopen to traffic. I'm most interested in seeing that the 2nd and H intersection should reopen in mid-August, which will make access to The Grocery Store That Shall Not Be Named much easier. And last week's VAT newsletter added that H Street's completion will also "feature a train viewing area at the south tunnel portal where a historical marker of the original tunnel will be in place," which I inadvertently captured in the photo at right, which I took earlier this month to document the new lettering on the tunnel entrance. There will be the new dog park on the north side of H as well. I think that's enough for now, except maybe to mention that the coming Bluestone Lane coffee shop has its signage up to the right of the 99 M lobby entrance. They apparently have a goal of opening by the end of August, but (all together now), We Shall See. After years of lobbying to get Major League Baseball's All-Star Game, followed by years of promotion and preparation, the festivities are finally about to arrive. And, to boot, there's Saturday's debut of Audi Field (outside of the JDLand coverage zone). This means that residents in both Near Southeast and Southwest are going to have tens of thousands of newcomers traipsing around to the various events. In other words, even if you have no interest in baseball, or soccer, or futbol, if you live in these areas, you are going to feel some impacts. The DC government has launched the spiffy sportscapital.dc.gov web site with scads of information on all of the events, and included among the pages is this equally spiffy Community Information flyer, with the schedule of events starting tomorrow, July 12, through the big shindig on Tuesday, July 17. The flyer also has information on road closures, bus stop impacts, taxi/rideshare pickup zones, and more. * The free "PLAY BALL Park" launches at Spooky Park (Yards Parcel A) at 1st and M Streets SE on Friday, July 13, running every day from mid-morning through late evening (times vary) until Tuesday, July 17. To quote MLB, "PLAY BALL Park is a 56,000 square feet interactive area that MLB and its programming partners will provide fun, engaging, and educational activities for youth baseball and softball players and their families - all in the backdrop of the Midsummer Classic." * On Saturday, July 14, bright and early at 8 am, the Color Run MLB All-Star 5K will start off by Nats Park and then run the Riverwalk circuit through the Yards Park, alongside THE Navy Yard, across the 11th Street local bridge, down into Anacostia Park, over to Poplar Point, and then back across the Douglass Bridge, finishing at 1st and M SE. Entries are still being accepted. * Nats Park itself finally gets into the action on "All-Star Sunday," July 15, with the All-Star Futures Game and the Legends & Celebrity Softball Game. Gates open at the ballpark at 2 pm. * Monday, July 16 brings not only the Home Run Derby at 8 pm, but the All-Star Workout Day. If you haven't gotten your tickets yet, it's on ESPN at 8 pm. Or you can stand on N Street and see if a ball comes your way. * Tuesday, July 17 is the day of all days, starting with the "All-Star Red Carpet Show" at the ballpark, and then the game itself at 7:30 pm. * Thursday's Summer Outdoor Movie is "A League of Their Own," at 9 pm at the Yards Park. * Friday has two concerts, both starting at 7 pm: White Ford Bronco at the Bullpen at and the 19th Street Band at the Yards Park. * The Yards is hosting the All-Star Summer Riverfest on Saturday and Sunday, from 10 am to 5 pm. Sayeth the web site: "The Yards Park will be transformed into a sandlot with games, activities, and entertainment." * The inaugural DC United game at Audi Field is Saturday at 8 pm. * Sunday brings another outdoor movie, this time "The Sandlot," at the Yards Park at 9 pm. * And, throughout the entire time, there will be a dozen "larger-than-life baseball inflatables" installed at both Yards Park and Canal Park. I will defer listing all of the food and drink specials, other than to mention that Mission and Walters Bar will both be operating on N Street. I would imagine most every restaurant and bar will be doing something special. And will be packed. If you want to know about events at the Wharf, or the Fan Fest at the Convention Center, or other details outside the coverage zone, here's the Post's big roundup. I am sure I will be tidbitting and retweeting throughout the next few days to try to keep up with items that are of particular interest to nearby residents, but will not be flooding the zone with full coverage. I'm guessing it won't be hard to find the latest! Going to be a pretty Nats Park-centric bunch of posts in the next few days thanks to All-Star Fever, so I thought I'd start off with a bit of a look back, while looking out. This weekend I brought the JDLand camera to a ballgame for the first time in a while, and spent much of the time wandering from vantage point to vantage point to take pictures. It's really hard for me to believe that it's been nearly 11 years since I first was shepherded up to the upper concourse and out onto various viewing platforms, with someone holding the back of my jacket while I shot because the railings weren't in place yet. If you want to see many more photos from these vantage points, dig deep down into the site for my Overhead Photos gallery, and choose either Ballpark, Southeast Viewing Platform, or Northwest Viewing Platform. With a hat tip to reader JES for unearthing this, I pass along the news that Walters Sports Bar is apparently coming to the southeast corner space of 1221 Van, at South Capitol and N, SE, after closing its Georgia Avenue location late last year. And, as a preview, they will be operating a pop-up bar in the new space for the fast-approaching All-Star hullabaloo, July 13-17. They will join Mission as the corner spaces in this residential building just north of Nats Park--and Mission will be "opening" for All-Star festivities as well, with a shortened preview menu in advance of its expected full opening later in July. More posts: Restaurants/Nightlife, West Half St. It runs from 6 am to 9 pm on summer weekdays, and 7 am to 9 pm on summer weekends, with hours extended to midnight on days of Nationals home games starting at 6 pm or later. As always, rides are $1, with various age-based, transfer-based, and payment type-based discounts. Meanwhile, on Monday DDOT is "beginning roadway improvements along M Street SE from First Street to 7th Street SE." This will be milling and paving, and will be done between 8 pm and 5 am "to mitigate impact on traffic in this busy corridor." Like on shiny new bus routes! * An interesting article on the new Douglass Bridge's design and planned construction from an engineering standpoint. * With all of those photos I took last week, it was time to update the Sliders, and I also took the opportunity to add a bunch of new angles to the Slider lineup. I can't embed them here, but here are screenshots that you can click on to see the sliding in action. Or you can scroll down through all 35 sliders that I updated/added, as well as browse the full archive. In the past few posts I've shown you the neighborhood's newest skeletons/skeletons to be, I've shown you buildings that are topped out but still getting exterior work done, and holes in the ground, and I know you are long since bored of this stretch of posts, but I will still do one more, looking at two projects that between them are managing to fall into all categories at once. Plus, they are probably the two most watched projects in the neighborhood at the moment. These are two views of JBG Smith's West Half 420-unit residential development, which, if I can count floors correctly, is still not yet topped out, but which, as seen in the second photo, is already hanging glass on the lower floors, presumably to protect the spaces from the roving gangs of All-Star hooligans that will descend next month. I think both photos do a good job of showing the very unique structure of this building, as it appears from the north to be funneling down into the ballpark. It also looks like the corner of the building facing the ballpark is prepped to have some signage hung. Digital? Temporary? Permanent? We Shall See! This building is expected to have about 65,000 square feet of retail on its first two floors. The east side of the street will be home to 1250 Half Street, a residential project that is both a nearly topped-out skeleton (on the north end of the site) and a still-not-yet-out-of-the-ground hole to peer into (on the south end of the site). It is actually all one building, it's just that the foundation was built on the north end back when Monument Realty had plans to develop the rest of the block as it was building the 55 M office building, before, well, you know, Things Happened. So this allowed Jair Lynch Development Partners to plow ahead with above-ground work there while prepping the rest of the former Monument Valley hole to go vertical. This building will have as many as 440 rental units and over 60,000 square feet of retail (including anchor tenant Punch Bowl Social) when it's finished, though I should note that it is going to be completed in two phases, with construction of the phase two "boutique residential building" facing N Street coming later. And here's what both will look like to people exiting the ballpark when they are finished. With that, I am done running down all of the latest construction statuses (statusi?). If you are worn out, don't blame me, blame the SEVENTEEN separate construction projects underway (19 if you include the Virginia Avenue Tunnel and the new South Capitol Street bridge). More posts: Development News, lynchhalf, photos, West Half St. I'll make this one a little more succinct. These are holes. They are all holes being dug for new residential buildings. There may be two additional holes by the end of the year. May I present to you the residetial projects of: Square 696, 1000 1st Street, and the Maren. Check the project pages for details. It took 27,000 steps and 1,600 photos for me to thoroughly photograph the status of the neighborhood's current construction projects--but I was up to the task, albeit with a necessary moment of refueling. * Meanwhile, up at Half and K, It's taken a while but the second phase of the Parc Riverside apartments is now visible from street level as well. * The last new arrival, the third portion of "The Collective" group of apartments known as the Garrett, is past the fences. I'm thrilled with the flow of tidbits (and how easy it is for me to add them as I see them), but still need to come up with a way I think to better alert people or highlight them. * News of the neighborhood's "Rooftop Hop" on Saturday starting at 2pm (RSVP required). * A farmers' market at Nats Park on Sunday, June 3 starting at 10 am. * A Post article on complaints of excess vibrations with the new Virginia Avenue Tunnel(s). * Greystar's purchase of the big CSX parcel that runs from New Jersey Avenue behind ORE 82 and 70/100 Capitol Yards. * The folks behind Circa deciding not to bring their Open Road "concept" to 99 M, but instead a new venture. And Circa is still coming, too. * Chase opening a branch at New Jersey and M.
If you didn't check back on last week's post, you missed additional tidbits about a construction permit for Wiseguy Pizza at Canal Park, a link to cool progress photos and timelines of the Virginia Avenue Tunnel, the news that the Yards Parcel L apartment building will be called "The Estate," and an office tenant moving from Maritime Plaza to 1100 New Jersey. But you can go read it now. 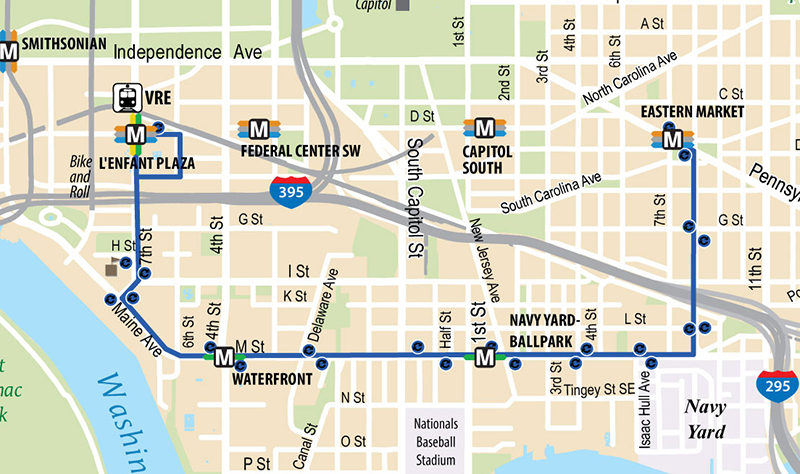 So keep checking on this post to see what tidbits will come, but I already know of one, which is the news that the new Circulator route that will run down M Street from Southeast to Southwest will start June 24. Here's what I wrote about it last year. This is not a forecast that screams, hey, let's hang out in a beer garden and socialize! So, with apologies, I am postponing the planned May 17 happy hour until a future date as yet undecided, when people won't need umbrellas and galoshes to get to the destination. But, in return for bailing on the loyal readers who were ready to make the trek in rain or snow or dark of night, I have something that might be of interest. And that is, I think I have come up with a way to quickly and easily share small tidbits of news, as they break, without waiting to pile them up in tidbits posts that turned out to be my undoing. And not just tidbits I find (since I won't always be on the lookout), but tidbits that readers pass along in the comments, as they have been doing for so many months. So, starting now, you'll now see at the bottom of posts a section called "Tidbits to Tide You Over." These will be a mix of things I've come across along with *vetted* items from readers, and each will be marked with who posted them. All coming from the comment threads. Here's an example. This will be an experiment--after all, my name (well, my initials) are on the masthead, and I have to be able to vouch for everything I elevate. And I might suggest that commenters both try to keep any tidbit offerings short and sweet, and to not try to flood the zone with every little thing--you don't want to get on my bad side. And I reserve the right to do light editing when elevating content. But if this works, it will actually succeed in making JDLand an even better destination for the latest in neighborhood goings-on than it has been in a long time. And I don't see it taking much of my time, leaving me better rested to write the longer posts on subjects I am interested in. Enjoy your deputization, loyalists, but use your powers wisely. And keep checking back to see what's new. I said I'd post when the urge struck and when I could provide a bit of additional background, and after watching this particular lot for 15 years, there's no way I could pass up the news that apparently the District Department of Transportation "intends" to move eastward from its current spot in the 55 M Street office building to 250 M Street, where it would be the sole office tenant in a new building to be constructed by WC Smith. According to ANC 6D commissioner Meredith Fascett, DDOT is wanting to occupy its new space by early 2021, which would mean construction would need to start in early 2019. This location is directly across from the US Department of Transportation, which means that I'll be forced to call this stretch the DOT block of M Street, SE. It also will share the block known as Square 769 with the currently under-construction mixed-income apartment building on the north end of the block. There are ANC and zoning approvals to be had, including giving the okay to WC Smith's desire to lower the building height to nine stories (as, ahem, illustrated at right), cut back on the ground floor retail space, and drop the expected parking spaces to 177 on three underground levels (instead of 197 on four). This building is actually part of the Capper-Carrollsburg PUD, and it was 10 years ago this month that the plan for an office building on this site received its preliminary zoning approvals. Then the Great Recession came along, building office buildings without substantial amounts of space pre-leased became a relic of another time, and WC Smith had to file for four two-year extensions to that zoning approval, the last in late 2016. As for DDOT's current home, it was in May 2010 that the rumor first came out that the agency would be moving to 55 M, which was a big get for that building and for the neighborhood in general at the time. And, this lot also is dear to my heart because it was the subject of one of the first photos I ever took in the neighborhood, with my film camera (with bad film in it, dammit) in the fall of 2000. And I thought when I first really started tracking the neighborhood in 2003 that it took what seemed to me to be for-eehhhhh-ver for that little gas station to be demolished, nine whole months after I started watching, one month after the photo at right was taken in August of that year. Little did I know. Just to prove I'm not going away completely (I think maybe I didn't emphasize that enough in my "pulling-back" post), I am inviting JDLand readers to come hang out at the Brig at 8th and L, SE, this Thursday, May 17, starting at 5ish. Come meet your neighbors, your fellow commenters, and the entire staff of JDLand (minus the felines). I'll be the old lady with the fake red hair. Hope to see you! In other news, while I am not walking back my decision to not write posts on little day-to-day stuff anymore--I'm already very much enjoying the guilt-eradication on that front--I have come up with a somewhat crazy solution that will allow the site to still have a steady stream of tidbits without my having to exert much energy. Stay tuned on that. And I'll still be writing longer posts when the mood strikes. Thanks to everyone for all of the lovely words these past few days. Now you know why it's so hard to extricate myself--you all are so good to me. My life would be much poorer without this little band of folks. Especially now.